This is where you can select which company you wish to import information from in FinancialForce. Prepaid Expense Type and Profit & Loss accounts are imported to be used as categories on each expense. Do not map — We won't import these into Expensify, but if you have them set up as defaults in FinancialForce, they will apply to the payable invoice. Tags — These are shown in the Tag section of your policy, and employees can select them on each expense created. Report fields — These will show in the Reports section of your policy. 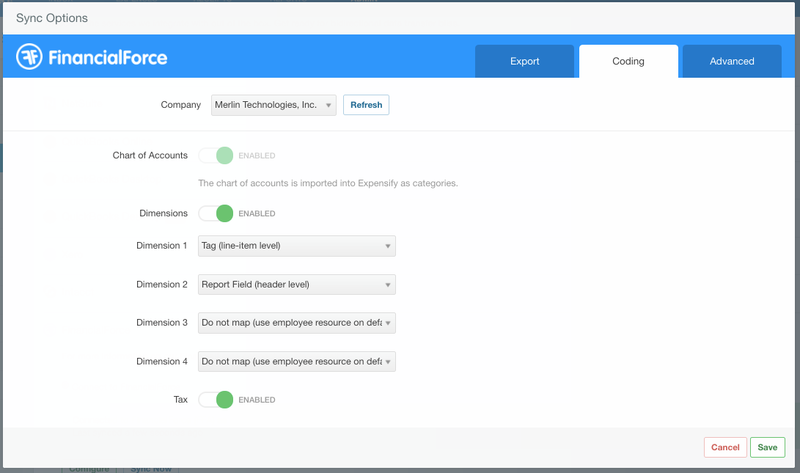 On reports, there will be a dropdown field, and employees can select one to be applied to the entire report. We import in your tax rates from FinancialForce to select on your expenses. Once your options are selected, just click Save to sync the settings, and you're ready to start exporting your reports to FinancialForce!